"Most Importantly, My smile was given to me by God, and it's priceless. hahahaha... Lol...'"
Girl you look ROCKIN! That dress is gorgeous, I love the style and the color looks beautiful on you - plus your makeup compliments it perfectly. Hope you had a great birthday! Yep. Shopping at a great price is kind of my specialty. hahaha. Thanks, and I'm glad to show you my face. It's kind of weird picturing only some set of nails talking to ya. Lol.. Girl you rocked it! Hoping you had a wonderful birthday! Thanks love, I did have a fab time. You are GORGEOUS! What a strong, amazing, inspiring woman!!! Very inspiring post! Thanks for sharing! :o) Cute dress, purple is my favorite color. You are so beautiful! And I love how you express Christianity in blog posts. In this world it's not always so easy... Be blessed! You are such and inspiration! And beautiful inside and out! your posts always bring a smile to my face :) me and my daughter (9 years old) LOVE to read your blog :) She told me to tell you that she loves your earrings that you're wearing with your birthday dress! Awww That make a bright smile come on my face. Having the little one read through my blog with you. That truly warms my heart. God bless you both. Happy birthday and you look beautiful! You look is beautiful!happy birthday!!!kiss!! Love the dress and earrings!! Happy Birthday!!! Girl, you look drop dead gorgeous!! 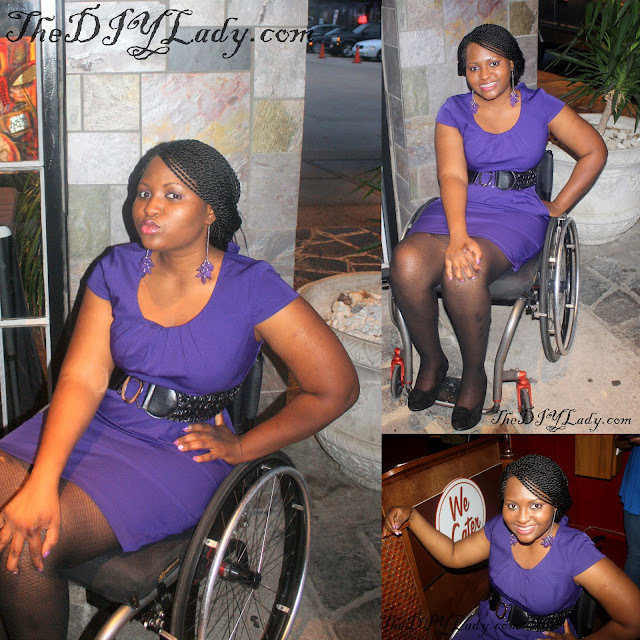 You may be in a wheelchair, but you still look HOT! And I know I certainly could use a little bit of a lesson in attitude from you! Feliz cumpleaños!!! quedaste muy linda, te luce mucho el morado! y tu cabello me encanta! Happy birthday to you lizzy, looking forever cutie. so proud of ya!...YNC! You are all so very kind. Thanks for your sweet words. I did have a wonderful birthday and it was fun!!! To those who call me an inspiration, Oh wow. I am honored. 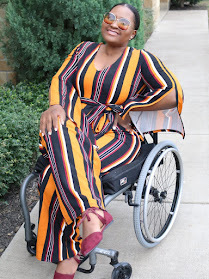 I didn't get here overnight and I sure hope someone out there who has given up or who is almost giving up realizes that there is ABILITY in disability. It sounds like a cliche, but honestly, the only thing we Cannot achieve are the things we don't try to achieve. Success, strength, and happiness do not come overnight, but with God and with continuous striving, we can all achieve those things. It's my joy to share this part of my life with you. Wow!!! You are beautiful both inside and out! Thanks for the gift of this writeup. Is it a coincidence that your house/blog is purple too *big smile* :)? I love the dress but it's the earrings that have totally got me - they're amazing! How hot are you? Purple is my favorite color and you rock the dress wonderfully. Thanks dear. Purple is gorgeous. Those earrings go so well with the dress, and you are right about the hair showing off your lovely smile! Lizzy,happiest of birthdays!! You look amazing. That color looks made for you. Beautiful testimony, too. God is awesomely powerful, and your outlook is remarkable. God is indeed awesome dear. I thank him for being my strength. I didn't do this on my own. 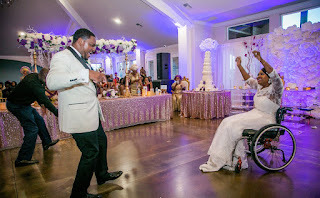 inspirational post....there is ability in disability! You look awesome! I can never find anything in Ross'! Happy belated birthday!! Hi you look absolutely beautiful i love Ross and DD's my birthhday is september 24th 6 more days!!!!!!! well happy late birthday your my role model!!! You're so kind. thanks and Happy Birthday in advance. :-) I Hope you have a blessed one.